A deer that made headlines earlier this summer after it was spotted on the streets of downtown Vancouver may have been fatally struck over the weekend. 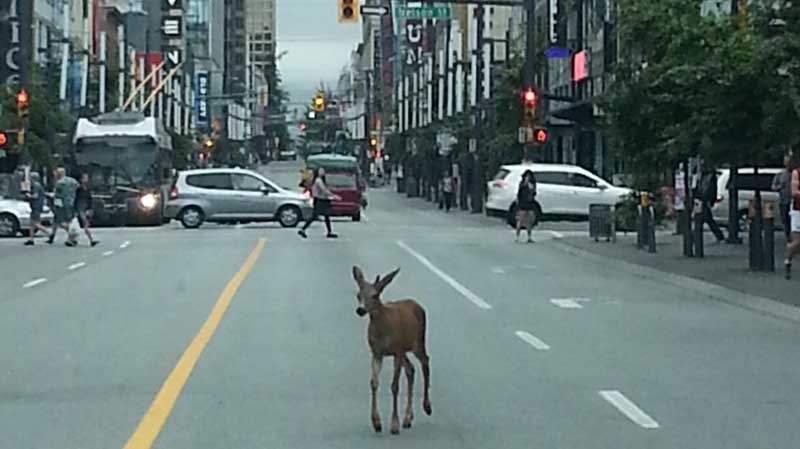 The so-called “Downtown Deer” first became a social media star after it was spotted strolling down Granville Street in July. It’s believed the animal swam over from the North Shore and later made its home in Stanley Park. Over the weekend, Vancouver police said a deer was fatally struck on the Stanley Park Causeway, near the Lions Gate Bridge. Police have not confirmed, however, if the animal is the same one that has been delighting tourists and locals in Stanley Park over the past few weeks. Conservations officers at the park have previously warned the deer was becoming too habituated with humans. Officials warned that as the deer became more comfortable with humans, the likelihood of it wandering onto roads or into more populated areas could increase. Photos of the deer have been widely shared on social media over the summer, with many using the hashtag #downtowndeer. A Twitter account was also created on the deer’s behalf.